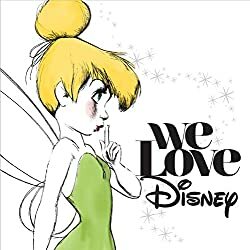 Verve Records and Walt Disney Records have collaborated on the compilation album We Love Disney. The album was produced by multi-platinum, 16-time Grammy® Award-winning producer and Verve Music Group Chairman David Foster. The album features singer-songwriter NE-YO on the Oscar® and a Golden Globe Award-winning song “Friend Like Me,” from 1992’s Aladdin; British pop singer and songwriter Jessie J on “Part of Your World,” from 1989’s The Little Mermaid; multi-platinum pop/R&B singer/songwriter Jason Derulo on the Oscar® and a Go lden Globe Award-winning song “Can You Feel the Love Tonight,” from 1994’s The Lion King; multi-platinum solo artist and No Doubt frontwoman Gwen Stefani on the Oscar®-nominated song “The Rainbow Connection,” from 1979’s The Muppet Movie; multi-platinum pop singer Ariana Grande on “Zero To Hero,” from 1997’s Hercules; singer/songwriter Jhené Aiko on “In a World of My Own/Very Good Advice” from 1961’s Alice in Wonderland; rock band Fall Out Boy on “I Wan’na Be Like You (The Monkey Song)” from 1967’s The Jungle Book; singer-songwriter and Capitol Records artist Tori Kelly on “Colors of the Wind,” the Oscar®, Golden Globe, and Grammy-winning theme song from 1995’s Pocahontas; critically acclaimed country artist Kacey Musgraves on “A Spoonful of Sugar” from 1964’s Mary Poppins; soul/R&B singer and Verve Recording artist Charles Perry on “Ev’rybody Wants To Be a Cat,” from 1970’s The Aristocats; British soul singer Jessie Ware on “A Dream Is a Wish Your Heart Makes,” which appears in both the 1950 animated film Cinderella as well as this year’s enchanting adaptation of the classic film directed by Kenneth Branagh and starring Lily James; and best-selling country group Rascal Flatts, accompanied by Hollywood Records’ artist-actress Lucy Hale duet on “Let It Go,” the top-selling, Oscar® and Grammy-winning song from the 2013 film Frozen. The album also features a rendition of “It’s a Small World” performed by all of the artists. Disney movies and music cross the generations. I’m sure you can think of at least one Disney movie or song that brings back fond memories. For me, that is the Winnie the Pooh theme song. A close second would be my a song from the original Muppet Movie (way back in 1979), “Rainbow Connection.” I loved that song so much that I used it as the title of my eighth grade valedictorian speech. We Love Disney is so much fun to listen to!! I love the fresh takes on classic Disney tunes by popular and up-and-coming musical artists. I found myself singing along and clapping my hands spontaneously (see if you don’t too). My favorite songs from the album are “Rainbow Connection” performed by Gwen Stefani and “I Wanna Be Like You” (from The Jungle Book) performed by Fall Out Boy. In addition, I was surprised by how much I enjoyed “Everybody Wants to Be a Cat” (from the Aristocats) performed by Charles Perry. It’s never been one of my favorite Disney tunes (or movies, for that matter), but in the hands of Perry, I could just picture a very cool cat jazzing out (someone like the Cat from Red Dwarf). We Love Disney is nostalgic entertainment the whole family can enjoy!! Don’t miss it!! Purchase We Love Disney on Itunes/Amazon.